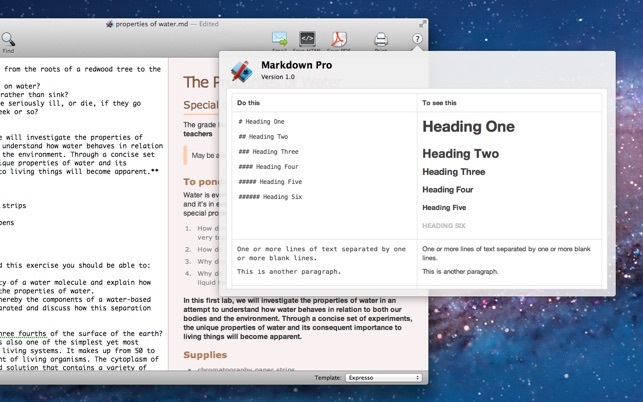 With Markdown PRO you can write beautiful documentation, notes, essays, term papers all by using plain text to tag your formatting such as bold, italic, lists and others. Need a heading? 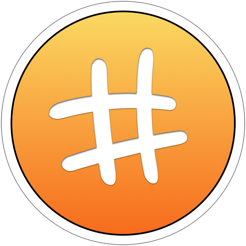 add # before your text; need to make a text italic? add * around your *text*. 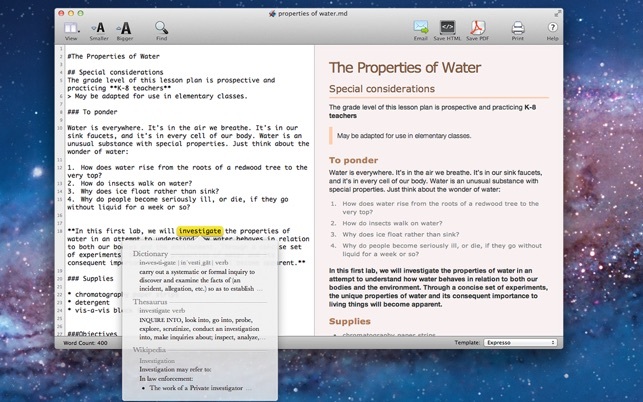 Using the plain text formatting, it is really easy and fast to type. You will never have to take your hands off the keyboard, so you can focus on writing. 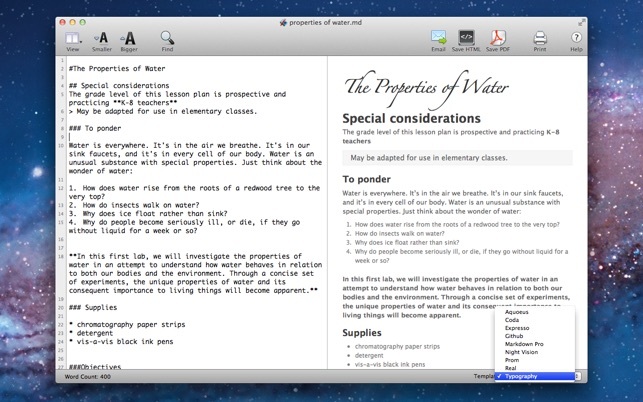 Markdown PRO provides live preview of beautifully formatted text using one of the provided templates. See the results as you type. It takes less than a minute to learn it! Your formatting stays where it should, with your text. You can apply a different template at any time to change the colors and size of the text you write. 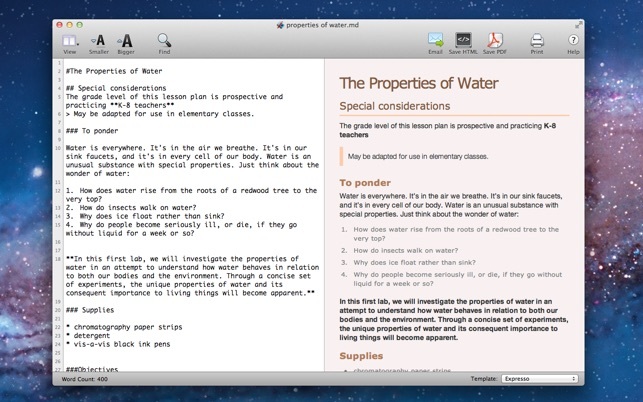 - Markdown Pro can run in full-screen mode, allowing you to focus on your work and remove distractions from your screen. 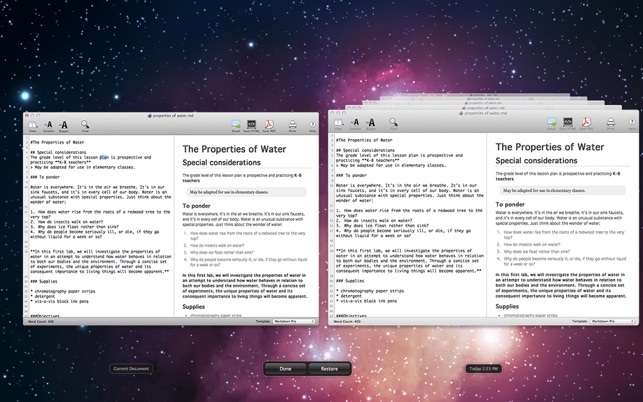 We utilize the native OS X Lion full-screen support and you can open more than one document in full-screen. - It's time to stop worrying about saving your documents all the time. We save your work automatically. You don't need to remember to press Command-S to save anything. - You know when you are working on your document and you regret the changes you made, but is too late because you have already saved it? Well, don't pull your hair anymore. Everything is saved. • UTF8 support. Write in any language! This is a 5 Start Markdown Editor but it has triggered my pet peeve of popping up a dialog to ask me to rate it when I was about to do something else. I can press "next time" but I risk geting distracted from why I started the edito and doing something else. It would be better to do this in a different way instead of disrupting the flow of people using the application.